Saket has some decent eating joints for office goers in J block market. By decent, I mean good quality, reasonably priced food which anyone can eat. 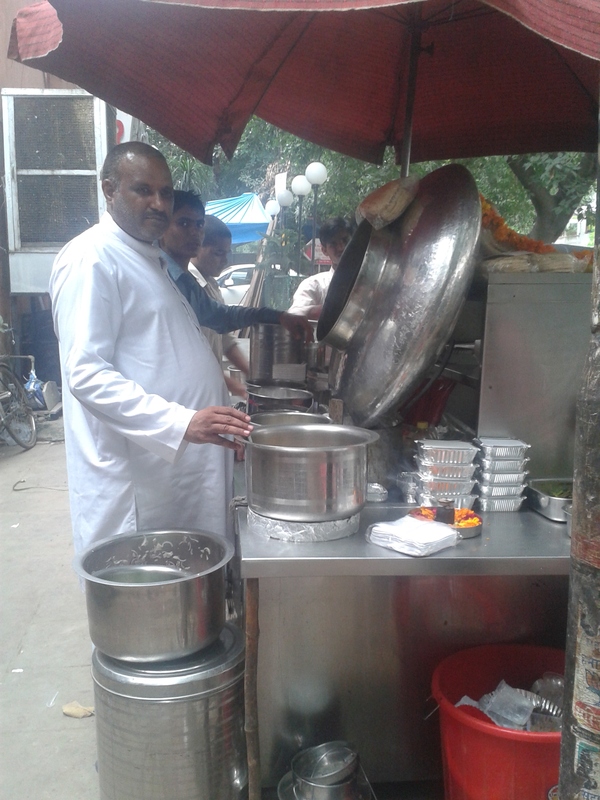 One such place in J block Market is Om Prakash Yadav‘s Chole Kulche. What attracted my attention to Yadav’s Chole Kulche cart was the horde of people of all age groups who thronged his stall – school children with empty lunch boxes getting chole kulche packed, office goers eating paranthas with chole and some of them getting packed chole kulche in Aluminium foils for their colleagues back in office. Om Prakash Yadav hails from Siddharth Nagar in Uttar Pradesh. He has been selling CholeKulche for the past 24 years. His cart is right opposite Neelu Nursing Home in J Block Market. The interesting part about Yadav ji’s Chole Kulche are the lemons which you can cut and squeeze over the chole yourself, unlike at other places where you need to ask the Kulche man for a few drops of lemon. Also, pickles of green chillies and mangoes are lying in huge quantity in a tray and one can pick as much as they want. I asked for the knife from Yadav ji to cut lemon in to two equal halves and squeezed them over the chole to make the spices a bit mild and savored them with kulchas which were soft and fluffy. A plate of Chole Kulche and Parantha Kulche is priced for Rs 30 and a glass of boondi raita is for Rs 20. So, next time you are around Saket Market, try Yadav ji’s Chole Kulche. To add that tangy flavor, do not forget to add the lemon juice.